As we head into the final stretch of our March Drum Madness, two undisputed giants face off in what may be the most bloody, brutal and downright heated readers poll we've ever put together. Are you ready for this? John Bonham vs. Neil Peart! 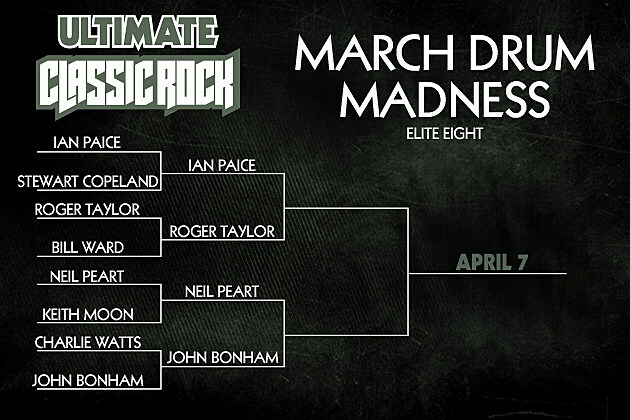 We placed 32 of the most famous drummers in classic-rock history into a bracket. We're now down to the Final Four, and just one round away from finding out your choice for the greatest rock drummer of all time. Not so surprisingly, both drummers pretty much trampled the competition on their way to this match-up. In the latest round, Bonham beat Charlie Watts with more than 79 percent of the vote. Peart checked in with an even more massive victory, pummeling Keith Moon with 83 percent. Now it all comes down to this. The winner will still have one final round to fight, but we doubt it will be as close as this one. It’s totally up to you, and you can keep coming back to the polls every hour between now and when voting closes at 11:59PM ET on April 2. The winner of March Drum Madness will be revealed on April 7.